our urban cottage: Pâté- For adventurous eaters! Many people do not know what pâté is nor would people want to eat chicken livers. However, if you are adventurous and are willing to try a new and delicious recipe, I think you will really enjoy it! 1. Cook your bacon. Save some of the bacon fat. Cook up your garlic and onions in the reserve bacon fat. 2. Add the chicken liver to the onion and garlic. Cook until there is no more pink. 3. 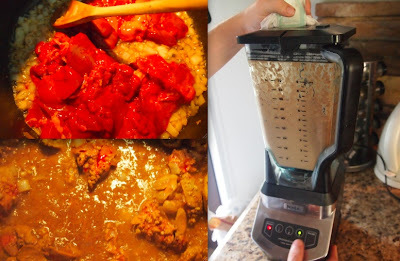 In a blender or food processor, add chicken liver mixture, crumbled bacon, cooking wine, salt, pepper and nutmeg. **Michael's tip: when blending warm ingredients make sure there is an opening in the lid and loosely hold a towel over the opening to prevent spilling. 5. Put blended mixture into the refrigerator and cool for 24 hours. 6. In the meantime, slice a baguette, drizzle some olive oil on top, put on a pan and toast in the oven. 7. We also serve our pâté with an onion relish. Slice 3/4 of a red onion. 8. Put onion and 2 cups of red cooking wine (or until onion is covered) into a saucepan at medium heat. 9. Add a splash of cranberry juice, a drizzle of balsamic vinegar and 1/2 tablespoon of sugar. 10. Reduce for 1 hour for optimal flavor, but you can cook for 30 minutes. 11. Pulse a few times in a food processor. 12. And put into a serving bowl. 13. Spread pâté on a crostini and top with onion relish. Enjoy! !